Could I Be On TV, Please? Of course, Bill was a human magnet for the dogs, who couldn't get enough of him. On the left is blind Pepper, right below Bill is blind Bud, and pressing on his left leg mostly out of view is blind Penny (all 90 pounds of her). That's blind Emmy Lou in the center, and off to the right is wobbly Allie. 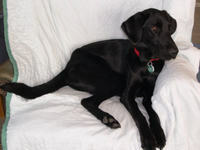 With all that doggie loving, Bill's biggest problem was just making sure the camera and tripod stayed still! We're going to be at Pet Fest 2006 at the Missoula County Fairgrounds tomorrow. The show opens at 10 a.m. We'll have a booth and our exhibit on disabled animals, and we'll have the Ambassador of the Rolling Dog Ranch, Miss Birdie, on hand to charm visitors. So if you're in Missoula and get a chance to stop by, we'd love to see you! Our horse trainer, Nichole Zupan, was here this evening to work with our blind two-year old, Nikki. I took this photo of Nichole riding Nikki in the round pen. To the right is Alayne on blind Domino. The cottonwoods have all turned gold and yellow now, and so too have the aspens. Today was one of those glorious fall days in the Rockies, as you can tell from the photo. In this shot you're looking to the southeast, facing Markum Mountain. On the way out to take that photo of Nichole and Alayne, I stopped and took this one, looking north towards Ovando Mountain. The white house is where Alayne and I live, and some of our first animal cottages are off to the right. The building on the far left is our main dog building, Widget's House. The animals love these beautiful fall days as much as we do ... but they also know that winter is right around the corner, so we're all soaking it in and enjoying it while we can. Alayne and I were getting up from the dinner table tonight when I looked over and saw this sight in the living room. 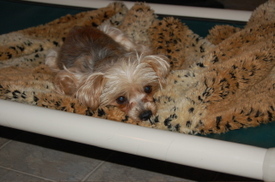 Our little paralyzed Yorkie, Spirit, was sacked out on a cot, quietly laying there and watching everything go on around her. Occasionally she'd move her head, but most of the time the only thing that moved were her eyes. She was tired from spending a lot of time in her wheelchair this afternoon, so she was ready to hang out. We had lifted her out of her wheelchair and set her on the cot to eat her dinner, and thus she was also resting with a full tummy when I took the photo. This is one odd-looking dog, wouldn't you say? I took this photo tonight of Travis when I was putting the dogs up at Widget's House. He was waiting for his treat. Part of our bedtime routine is that everyone gets a cookie when they go into their crates for the night. The problem is that Travis has a fused jaw, so he can't open his mouth to eat a cookie. We go down the line of crates, handing out a cookie to each dog in turn, but have to skip Travis. So Travis now gets his own special good-night treat. We have a squeeze tube, the kind backpackers use for things like peanut butter. It's stuffed with canned dog food, and at bedtime I squirt a dollop into the corner of Travis' mouth -- this is the one place he can get his tongue out between his upper and lower jaw -- and he licks it up. Getting it in requires some hand-and-mouth coordination between man and dog. I hold up his lip with one hand, wait for the tongue to come poking out between his teeth, then with my other hand quickly lay a ribbon of the food on his tongue before it disappears back inside his mouth. As soon as I finish squeezing out the treat, I drop his upper lip so it can help hold the food in place while his tongue works it into his mouth. (I bet that's more than you wanted to know.) In any case, it takes only a few seconds if done right. If Travis and I misfire, the dollop ends up on the crate bedding and we start over. I took this photo today of Alayne with blind Stoney on the left and blind Allie on the right. 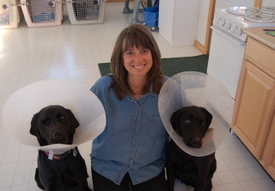 Both Labs are wearing cones for issues that cropped up over the weekend. Allie developed what I thought was a corneal ulcer on her left eye. 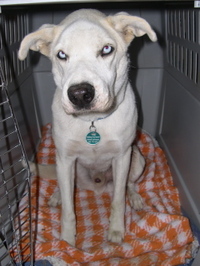 We took photos Saturday morning and emailed them to our vet in Helena, Dr. Brenda Culver, for review. Brenda agreed it looked like a corneal ulcer, and she gave us a treatment plan for the weekend that included, yes, the cone. Here's one of the photos I emailed to Brenda yesterday morning. The irony is that we had been treating this same eye with medication for the past week because it was bothering Allie, and thought we had it under control. It actually looked really good through Friday, and then bang, this thing erupts. 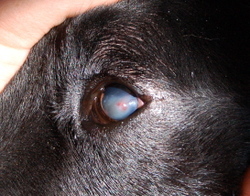 The white stuff is an edema, or fluid under the corneal surface, surrounding the actual ulcer. On Saturday afternoon we noticed Stoney was licking and worrying her left rear foot ... for what I suspect is an abscess that's beginning to heat up. There's no break in the skin, no blood, no thorn, but the skin between her paw pads is warm and looks red, and it was tender to the touch. So we put her on some medication and fixed a cone on her head, too. I'm taking both girls to the vet clinic on Monday. In the meantime, it's conehead city around here. On Saturday I took this wonderful photo of one of our awesome volunteers, Katie R. from Helena, who had just come back from walking Claude the blind Great Dane puppy. (Yes, still a puppy!) Katie had scrubbed and filled water tanks and mucked out barn stalls, and then finally got a chance to do something fun, like take Claude for a walk. Thank you, Katie! Spirit, the little Yorkie with paralyzed front legs who came to us in late August, got her wheelchair today ... and she was off and rolling! (See original post on Spirit here.) 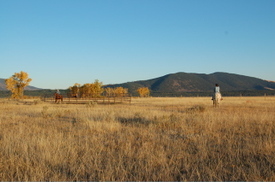 Lori and Chad Holbein, owners of Doggon' Wheels, came out to the ranch two weeks ago to measure Spirit for her wheels. Today they returned with the new wheelchair. I took the photo of Chad and Lori fitting her in our welcome center this afternoon. Not only did Lori and Chad come out twice to personally take care of Spirit, but bless their hearts, they even donated the wheelchair! Thank you! We were just so touched by that generous gift. Sitting atop her new wheels, Spirit didn't know what to do at first ... it had been a long, long time since she had done anything other than hop with her back legs and then fall flat on her face. But then we brought Oscar the miniature Dachshund into the welcome center and set him on the floor ... and she scooted off to check him out. That was the first sign she could use the chair. Then she got perplexed and seemed to lose focus and interest. She began crossing her back legs, which limited her ability to push off and propel herself forward. The answer? A cat! We picked up Spirit in her chair and carried her out to Lena's Barn, where Smudge the barn cat helpfully appeared. That motivated Spirit all over again, and she took off after Smudge, but only briefly. The ground in the barn aisle is kind of rough and hard to wheel around in. We couldn't tell whether she had given up because of difficulty using the chair or the ground itself. Hence we were still trying to determine how well she could really function in the chair, so I suggested we take her into the cat house, which has a smooth linoleum floor. A few minutes later, we set Spirit down on the cat house floor. Her eyes got really big at the sight of all those cats, and off she went! She wheeled from one end to the other, checking out the cats and letting them know who's boss (or so she thought). That answered the question ... yes, she can really use that chair and has full mobility. Of course, it will take time for her to learn how to back up and turn. (She puts on a little too much left rudder!) But even in her first hour this afternoon using the chair, she had started backing up. To show you this little girl cruising in her new wheels, I shot some video this evening of Spirit on our back patio. Bear in mind that when I took this video, she had been in her chair for an elapsed time of maybe 15 minutes. I think we're off to the races with her! 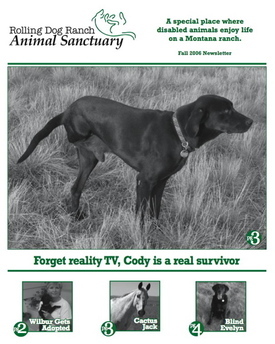 We just updated the sanctuary Web site, including posting a PDF of the fall print newsletter, a new slide show, and Web pages for some of our new arrivals in the Meet the Animals section. Regular blog readers will recognize a few of the photos in the slide show, but others will be new -- including some stunning scenic shots. 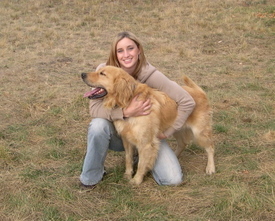 Buzz, our Golden Retriever with a neurological issue, was adopted today by Chelsea K. from Dillon, Montana. Chelsea had called us a few days ago after seeing Buzz on the Web. She had lost a Golden of her own a year ago when she was living in Idaho -- tragically, it was stolen. 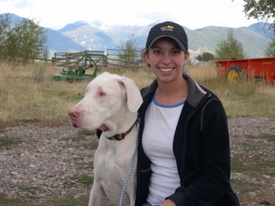 Her dog was one of several purebred dogs stolen during a bizarre dog theft spree in her community in Idaho that year. Now she was ready to bring another Golden into her life, and she was particularly interested in a special needs one. Well, that's Buzz! So Chelsea drove up this afternoon from Dillon and spent a lot of time with Buzz. She also brought along her other dog to see how the two would get along. After a couple of hours together, all three got in her truck and drove home to Dillon. Alayne took this shot of Chelsea with Buzz just before they left. Now that's a happy photo! Judging from the number of emails and blog comments I've been getting, it seems I'm overdue with news about blind Cinder and her babies. We had an update in our September email newsletter we sent out last week, but I forgot I hadn't posted anything on the blog. 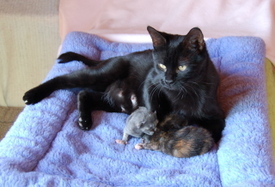 In keeping with our 'fire' theme, we named the tortoiseshell kitten Spark and the gray kitten Ash. We're happy to report that Cinder, Spark and Ash are all doing fine!